Sharifi, H., Kheirollahi-Hosseinabadi, I., Ghasemi, R. (2015). The Effect of Tempering Treatment on the Microstructure and Mechanical Properties of DIN 1.4021 Martensitic Stainless Steel. International Journal of Iron & Steel Society of Iran, 12(1), 9-15. H. Sharifi; I. Kheirollahi-Hosseinabadi; R. Ghasemi. "The Effect of Tempering Treatment on the Microstructure and Mechanical Properties of DIN 1.4021 Martensitic Stainless Steel". 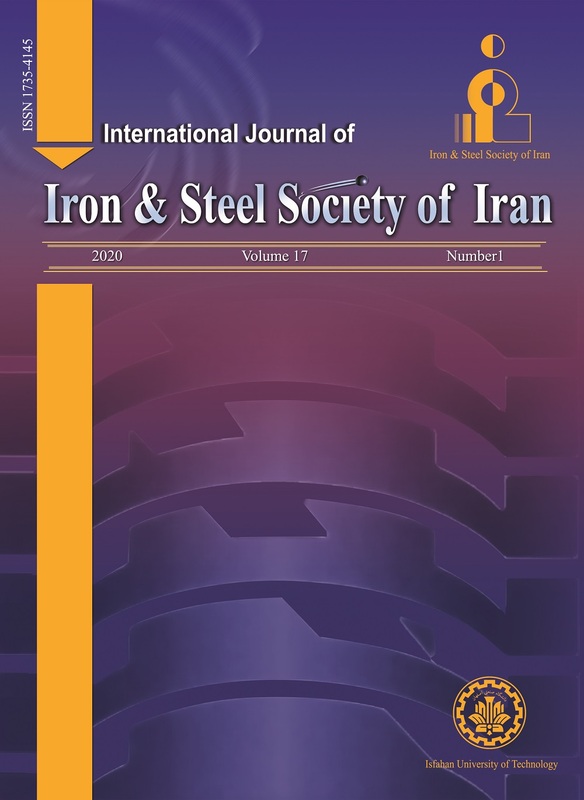 International Journal of Iron & Steel Society of Iran, 12, 1, 2015, 9-15. Sharifi, H., Kheirollahi-Hosseinabadi, I., Ghasemi, R. (2015). 'The Effect of Tempering Treatment on the Microstructure and Mechanical Properties of DIN 1.4021 Martensitic Stainless Steel', International Journal of Iron & Steel Society of Iran, 12(1), pp. 9-15. Sharifi, H., Kheirollahi-Hosseinabadi, I., Ghasemi, R. The Effect of Tempering Treatment on the Microstructure and Mechanical Properties of DIN 1.4021 Martensitic Stainless Steel. International Journal of Iron & Steel Society of Iran, 2015; 12(1): 9-15. To investigate the effect of tempering treatment on mechanical properties and the microstructure of DIN 1.4021 Martensitic Stainless Steel, austenite treatment was conducted for the samples at 1000 ºC temperature for 60 min and then the samples were oil quenched. Later, tempering treatments were performed for the samples at 500 ºC and 700 ºC temperatures for 2 and 5 h, respectively; then quenching in oil was conducted. After the heat treatment, hardness, tensile strength and impact tests were performed to investigate mechanical properties. Moreover, optical microscopy and field emission scanning electron microscopy (FESEM) were performed to investigate microstructure observations and fracture surfaces. X-Ray diffraction (XRD) was carried out to measure the austenite retained in the samples. The results showed that due to the formation and precipitation of alloy carbides Cr7C3, the tempering treatment at a temperature of 500 ºC increases hardness, tensile strength and yield strength and reduces the amount of impact energy of the samples as well. C. Garcia de Andres and L. F. Alvarez: J. Mater. Sci., 28(1993), 1264. A. F. Candelaria and C. E. Pinedo: J. Mater. Sci., 22(2003),1151. H. Everson: Proc. Of 3rd Int. Charles Parsons Turbine Conference, Sweden Technology Center, Sweden, (1995), 1. K. P. Balan, A. Venugopalreddy and D. S. Sarma: J. Mater. Eng. Perform., 8(1999), 385. C. Garcia de Andres, L. F. Alvarez, V. Lopez and J. A. Jimenez: J. Mater. Sci., 33(1998), 4095. Y. Y. Songa, D. H. Pingb, F. X. Yinb, X. Y. Li and Y. Y. Li: J. Mater. Sci. Eng. A., 527(2010), 614. R. W. K. Honeycombe and H. K. D. H. Bhadeshia: Steels-Microstructure and Properties,2nd ed, London, Edward Arnold, 1995. D. H. Ping, M. Ohnuma, Y. Hirakawa, Y. Kadoya and K. Hono: J. Mater. Sci. Eng. A., 394(2005), 285. W. Uhlig HH: Uhlig’s Corrosion Handbook, 2nd ed, John Wiley, 2000. W. J. Kaluba, T. Kaluba and R. Taillard: J. Sci. Mater., 41(1999), 1289. L. F. Alvarez, C. Garcia de Andres and V. Lopez: ISIJ. Inter., 34(1994), 516. K. Amini, M. R. Hoda and A. Shafyei: J. Metal. Sci. Heat. Treat., 55(2014), 499. A. NaseryIsfahany, H. Saghafian and G. Borhani: J. Alloys. Comp., 509(2011), 3931. Z. De-ning, H. Ying, Zh. Wei and F. Xu-Dong: J. Iron. Steel. Inter., 17(2010), 50. M. Guttmann: J. Surf. Sci., 53(1975), 213. S. Suzuki, M. Obata, K. Abiko and H. Kimura: J.Sci. Metall., 17(1983), 1325. J. Kameda and Y. Nishiyama: J. Mater. Sci. Eng .A., 528(2011), 3705. G. V. PrabhuGaunkar, A. M. Huntz and P. Lacombe: J. Metal. Sci., 14(1980), 241. M. Guttmann, Ph. Dumoulin and M. Wayman: J. Metall. Trans. A., 13(1982). 1693. M. H. KhaniSanij, S. S. Ghasemi Banadkouki, A. R. Mashreghi and M. Moshrefifar: J. Mater. Design., 42(2012), 339. Y. Tomita and K. Okabayashi: J. Metall. Trans. A., 16(1985), 83. A. H. Meysami, R. Ghasemzadeh, S. Seyedian and M. R. Aboutalebi: J. Mater. Design., 31(2009), 1570. M. Jafari and K. Tsuzaki: J. Alloys. Comp., 577(2012), 636. R. Guillou, M. Guttmann and Ph. Dumoulin: J. Metal. Sci., 15(1981), 63.